WILLIAM SCHARF. Our subject has reached that age when the dignity of years well spent in active and productive labor exempts him from the weariness of toil at the present time. He is now recognized as one of the prominent and wealthy retired farmers, living at a pleasant distance from the busy town of Sorento, in Shoal Creek Township, Bond County. The town of Sorento when laid out included a part of what was then his farm. 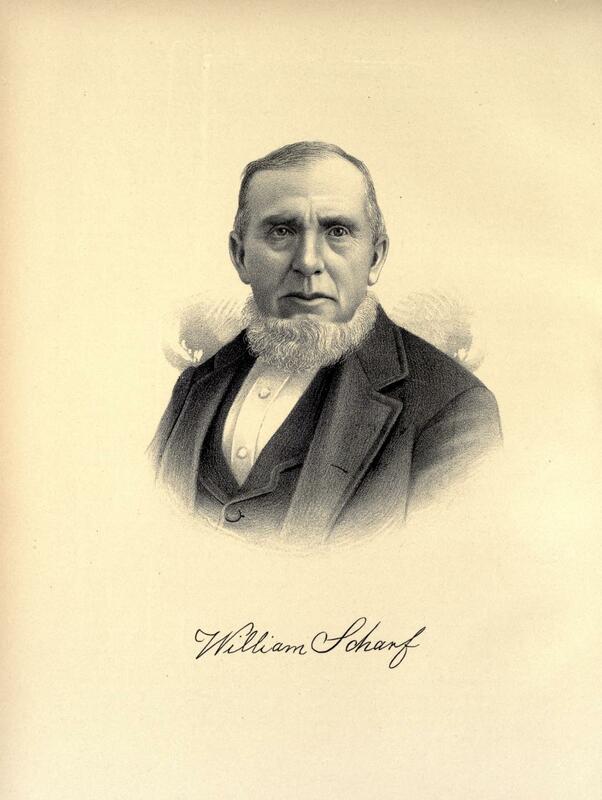 Mr. Scharf was born in the province of Schlesien, in the kingdom of Prussia, August 11, 1825. Early in life he learned the blacksmith's trade, which he followed in his native land until he went to America in 1852. 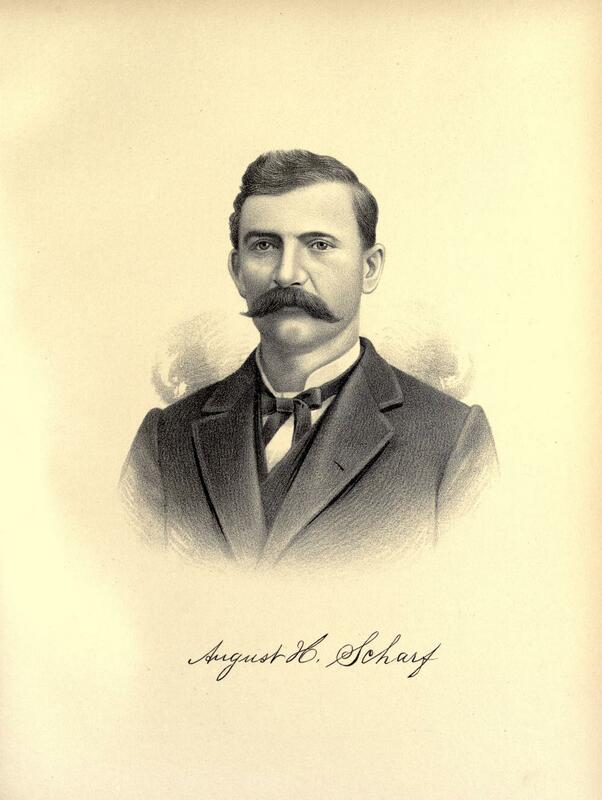 After that time, he was employed at his trade in St. Louis for four years, and in 1856 he purchased one hundred acres of land in Pleasant Prairie, Bond County, where he has ever since lived. While residing in Missouri, February 18, 1854, our subject was married to Augusta Lohmann, who is a native of Hanover, Germany. She had one child, who, on her mother's marriage to Mr. Scharf, took that name. He grew to manhood, the pride of his foster father. It was this child, August Scharf, who laid out the thriving town of Sorento. It was also he who organized the Sorento Coal Company, and to his push and energy the people of the town are greatly indebted for the many enterprises that make of it a noted commercial center. He had the advantages of an excellent education, and was a naturally brilliant and capable business man. His community received his constant attention, and everything that was possible for him to do that was for the interest of the town, he willingly sacrificed himself for, if necessary, and when he was cut down in the prime of life, and in the days of his greatest prosperity, by the fell destroyer. Death, the mourning was universal. Sorento felt that not only a good and noble man was taken from her midst, but that one of the mainstays of the place was removed when he was most needed. He died November 12, 1891, at the age of forty-two years. The large fortune which he left goes for the most part to the two other children that his parents reared: Thomas Scharf and Augusta Lohmann, the latter the wife of Charles Reum. A small portion of it goes to Rhoda M. (Cole) Scharf, to whom he was married on his deathbed. The wife of William Scharf and the mother of August died January 9, 1890. They had no other children, but those already above mentioned received the tender parental care that comes only from great and generous hearts. Mr. Scharf is possessed of an ample fortune, and takes all the comfort he can get from these latter years of life. Mr. and Mrs. Charles Reum and his adopted son Thomas reside with him in his home adjoining Sorento. There is a satisfaction to the observer of many of the freaks of fate, in the fact that occasionally merit reaps its own reward, and patience, perseverance and industry do not become so warped that the broader interests of life cannot be thoroughly enjoyed. Extracted 04 Dec 2016 by Norma Hass from 1892 Portrait and Biographical Record of Montgomery and Bond Counties, Illinois, pages 243-245.